Mumbai : Craze for Bollywood films has long surpassed the Indian audiences and has set foot in countries all over the globe. People from various nationalities have taken to the likes of Bollywood cinema & eagerly await the release of the latest blockbusters in their countries. That’s where online platforms like Eros Now kick in. By releasing 3G online on the same day as its cinema release, Eros Now provides Bollywood with a platform to extend to international markets. Moreover, users can sign up today & enjoy a 14 Days Free Trial too. Eros Now also offers Pay-Per-Service, which allows the user to choose a film they want to watch and pay only for that. Apart from the paid service, the portal has several music videos and songs to watch for free. The ides of March was a memorable day for Eros Now, as for the very first time, it released a film online on the very same day as its theatrical release! 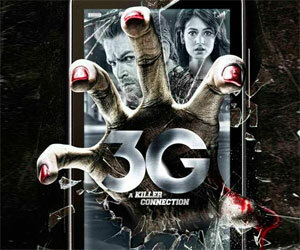 3G- A Killer Connection hit the theatres on the 15th of March. Eros Now, an online platform for Bollywood & Tamil Blockbusters showcased the film online for those countries that didn’t have a theatrical release of the supernatural-thriller. Whilst the film had theatrical release in India, UAE, Pakistan, Fiji & Mauritius, the rest of the world was able to watch the film online on Eros Now. By doing so, Eros Now ensured that Bollywood fans across the globe were finally up-to-date with their favorite films & didn’t have to wait until later to catch them online. This one-of-a-kind move by Eros Now has created a stir amongst audiences, especially the international ones!